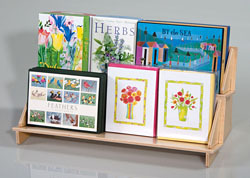 Do you have a bookstore, travel store, library or gift shop and are looking for an elegant, affordable way to organize and display books, cards and other materials. Our sustainable birch plywood racks, stands, and other holders allow you to feature products on any countertop in an appealing and accessible way. Place one of our woodn displays near the checkout line so customers can browse on their way out and make a last minute impulse buy. Made with care in our US factory, most items are in stock and available for immediate shipment.